250 pages | 3 B/W Illus. Liberation psychology is an approach that aims to understand wellbeing within the context of relationships of power and oppression, and the sociopolitical structure in which these relationships exist. 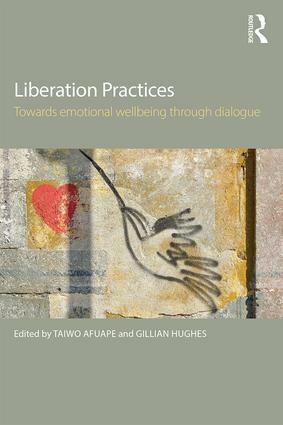 Liberation Practices: Towards Emotional Wellbeing Through Dialogueexplores how wellbeing can be enhanced through dialogue which challenges oppressive social, relational and cultural conditions and which can lead to individual and collective liberation. Taiwo Afuape and Gillian Hughes have brought together a variety of contributors, from a range of mental health professions and related disciplines, working in different settings, with diverse client groups. Liberation Practices is a product of multiple dialogues about liberation practices, and how this connects to personal and professional life experience. Contributors offer an overview of liberation theories and approaches, and through dialogue they examine liberatory practices to enhance emotional wellbeing, drawing on examples from a range of creative and innovative projects in the UK and USA. This book clearly outlines what liberation practices might look like, in the context of the historical development of liberation theory, and the current political and cultural context of working in the mental health and psychology field. Liberation Practices will have a broad readership, spanning clinical psychology, psychotherapy and social work. Taiwo Afuape is a Clinical Psychologist and Systemic Psychotherapist who has worked with transitional populations, torture survivors in a human rights charity and adults in a mental health systemic service. Currently she is lead psychologist and systemic therapist for Openminded - South Camden Community CAMHS, Tavistock Foundation NHS Trust and Lead systemic therapist of an adult mental psychology and psychotherapy department in CNWL NHS foundation trust. She published Power, Resistance and Liberation in Therapy with Survivors of Trauma in July 2011. Gillian Hughes is a Consultant Clinical Psychologist and Systemic Psychotherapist who currently leads the Child and Family Refugee Service at the Tavistock and Portman NHS Foundation Trust. Throughout her career she has worked in the state sector in inner-city locations with marginalised communities as a practitioner and trainer, where she has developed innovative community, systemic and narrative approaches.